1993's Voice of Jamaica was a stellar set, an aural collage of the island, with its swirl of diverse styles, sounds and themes. Bringing dancehall to the wider world, that album was a revelation, and to attempt to better it would have been futile. 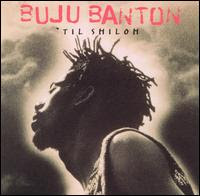 And so, Buju Banton didn't try, instead he moved in a new direction. After the completion of Voice of Jamaica, two of the Banton's friends were killed; their murders prompting him to re-evaluate his own life, leading to his conversion to Rastafarianism, and bringing to an end his glorification of the gun. These life-changing events are reflected throughout much of 'Til Shiloh, which proves a much more introspective set than anything heard from Banton before. This is most evident on the haunting sufferer's song "Untold Stories," as Banton reflects on the world around him, beautifully accompanied by a gentle rhythm and Glen Browne's evocative acoustic guitar. But Jah now sustains him, prompting the artist to open the album with the brief a cappella psalm, "Shiloh," then launching into "Til I'm Laid to Rest," which revisits the sufferer's theme, but intertwines it with an homage to Africa and his faith in the promised land. Still, Banton has not yet found peace, and his inner turmoil is at its rawest on "Murderer." Written in the aftermath of the aforementioned killings, Banton struggles with his grief and fierce desire for vengeance; all else pales before this most emotionally powerful of songs. It's "Not an Easy Road," as Banton vividly relates on that song, and he has been left vulnerable. Still, he opens his soul on "Wanna Be Loved," and exposes his loneliness on "What Ya Gonna Do" joined by Wayne Wonder. "Complaint" has Banton toasting over this fabulous Garnett Silk number, praising Jah and scattering the heathens before him. "Chuck It So" takes a similar stance, as Banton takes on a Big Man, with the 2 Friends Crew sweetening his ferocious assault. It's a heavy-hitting album, with only "Hush Baby Hush," a jubilant version of the 1960 classic "Stay," adding a lighter note to the proceedings. Musically, however, this is a gentler album than its predecessor, although still very much in a dancehall style. Another masterpiece.